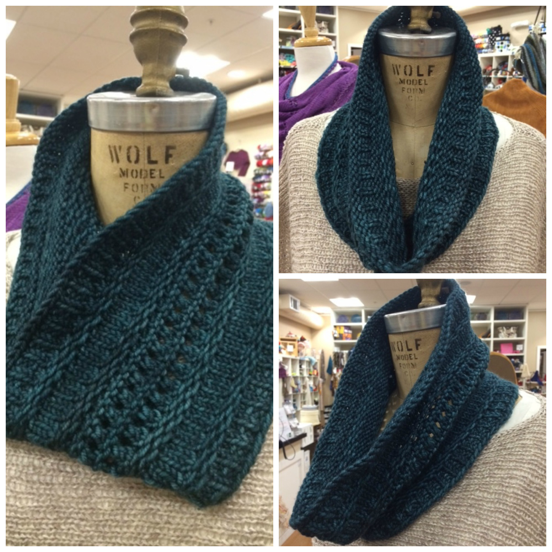 Let's continue to expand your beginning knitting skills! In this two-part workshop, you will knit the A Yarn Less Raveled Autumn Cowl, and along the way, you will learn to knit in the round using circular needles. You will also learn to increase and decrease, and incorporate a simple eyelet lace pattern. Free pattern with class. Completion of "Let's Begin: Learn to Knit" workshop and/or ability to knit, purl, cast on, bind off and read a simple pattern. Please purchase your project yarn at the shop; you will receive a one-time 10% discount on your class yarn purchase. Materials Included: Pattern provided with class. Please purchase your project yarn at the shop; you will receive a one-time 10% discount on your class yarn purchase. Requirements: Completion of "Let's Begin: Learn to Knit" workshop and/or ability to knit, purl, cast on, bind off and read a simple pattern.